Storage of pesticides must be fully compliant and follow strict regulations. It is required to prevent contamination from water, food, feed or other materials that are stored in the surrounding areas. Pesticide containers must be marked properly with correct labels – stating proper pesticide information and proper disposal and reuse of containers. US Chemical Storage talks about Kansas pesticide storage regulations, disposal practices, housing bulk pesticide storage containers, maintenance requirements and required documents below. Pesticide wastes can be very hazardous to the environment and human health alike. Improper disposal of excess pesticides is a violation of federal law, and improper disposal of any pesticide storage can result in hefty fines. Pesticide storage waste must be disposed of properly according to the Kansas State Pesticide or Environmental Control Agency or a Hazardous Waste director. Patching damaged pesticide containers with tape is only allowed if the label is still readable and contents of the packaging are complete (usually only bags). Contact the Kansas Environmental Control Agency for more information on patching. When housing bulk pesticide storage containers in a Pesticide Storage Building by US Chemical Storage it is necessary that proper maintenance requirements are completed regularly. 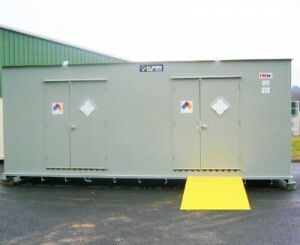 *If the pesticide storage is flammable, corrosive or toxic do not go near the hazardous situation. Remain in a safe location until hazmat response teams are on the scene. Certificates of Registration: Pesticide distributors or dealers must display current certificate of registration in a prominent location, visible to the general public. Keep your inventory away from direct sunlight, or heat. Pesticides may be volatile to combustion. Manage and update a current list of inventory for all pesticides that are being stored. Keep your pesticide storage facility free from combustibles. Make sure your pesticide storage locker is placed on a level ground, where runoff is limited to none. Keep inventory in a secure container where it cannot be accessible to unauthorized persons when unattended. Keep inventory maintained and compliant. While this document may cover a number of important compliant pesticide storage solutions, it cannot address every single situation for keeping pesticide storage maintained and compliant. For a full list of Kansas pesticide storage regulations, refer to your state’s requirements, such as the Kansas Department of Agriculture, or the Kansas Department of Health and the Environment for total coverage of regulations.